Side A: Heracles battles the nine-headed Lernaean Hydra as one of his twelve labours. The heads of the serpentine beast are bearded. The hero grasps the monster by the neck. His shield is decorated with the image of a winged horse. The two-headed hound Orthrus, brother of the Hydra, lies dead beneath the feet of the hero, blood spraying from an arrow-wound on its neck. 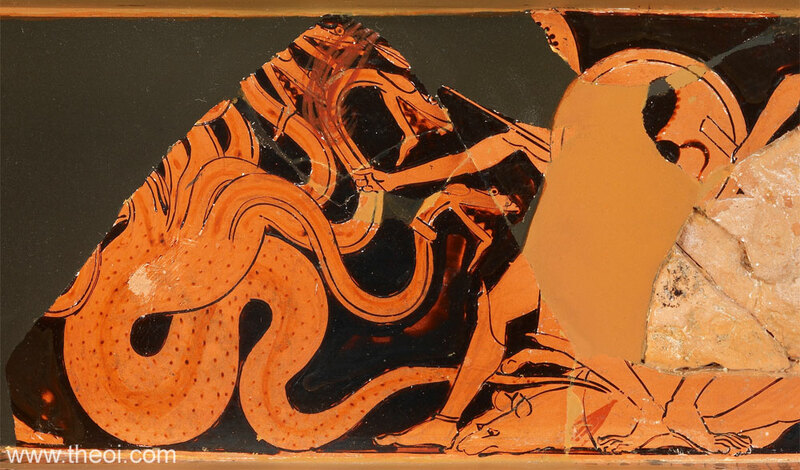 The dog, however, belongs to the next scene on the vase which depicts Heracles encounter with the giant Geryon. Some of the other labours of the hero also appear on the vase, including the battle with the Hesperian dragon, a creature resembling the Hydra coiled around the trunk of a tree (see other image). Side B: Peleus wrestling Thetis (see other images).